Television script writers would have had a ball with this one simply by calling it 'A Day in the Life of the Forster Family' and letting the cameras roll. It was closing day of the 2018 thoroughbred season Sunday at Hastings Racecourse and Hall of Fame trainer Dave Forster was hosting a 70th birthday party for his wife Terri. Family and friends celebrated throughout the afternoon in the privacy of the Skybox high above track level. Terri's beloved Santa Fe Trail from the Forster Stable in Langley was entered in the second-to-last race of the year. A field of eight B.C.-bred non-winners in 2018 settled in at post time with the intent of paying some season-ending bills for their owners. The best that jockey Antonio Reyes could do over the opening half-mile of the 1 1/16-mile test was to be patient with Santa Fe Trail running last. But as birthday wishes would have it, Santa Fe Trail blazed home a winner overtaking Parsimonious by a neck at the wire. Adding to the revelry, son Drew had chosen the family five-year-old to win in his Track Handicappers' Picks that appear in the Hastings program every race day. It was the 112th time over the course of the season that Drew had selected a winner in the Handicappers Press Box Challenge, giving him a one-pick victory over defending champion Randy Goulding of the Daily Racing Form. It was the proverbial icing on the cake to 'A Day in the Life of the Forster Family' sitcom at Hastings Racecourse. Darren MacDonald, General Manager and Director, BC Racing, will be announcing the 2019 Hastings schedule shortly. In the meantime, preparations are in high gear for the annual Thoroughbred Awards Dinner & Hall of Fame Inductions at Newlands Golf and Country Club on Nov. 29. With five trips to the winner's circle on closing weekend (four Saturday; one Sunday) Amadeo Perez finished the season as Leading Jockey with 57 wins, 10 more than runner-up Enrique Gonzalez. Perez also won the title in 2014 and 2012. Lenny Seecharan, who gained tremendous media attention this year along with his Trinidadian twin brother and fellow Hastings rider Learie, made 12 visits to the winner's circle in 2018 to gain the nod as Leading Apprentice Jockey. Phil Hall enjoyed another bang-up year with 40 wins as Leading Trainer for a second consecutive season while Glen Todd's North American Thoroughbred Horse Company also scored a repeat effort as Leading Owners with 23 wins. The 2019 B.C. Horse Racing Hall of Fame inductees include former president of the Canadian Thoroughbred Horse Society (B.C. Division) Leif Nordahl in the Builders Category along with the Dittloff family – Ed, Gladys and daughter Karen – in the Breeders Category. 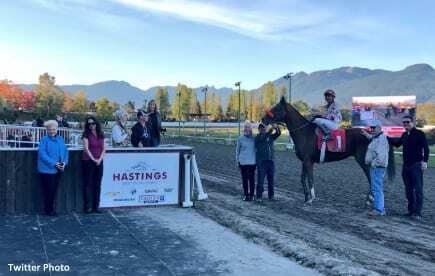 This entry was posted in People and tagged british columbia, Darren MacDonald, dave forster, drew forster, Hastings, Hastings Racecourse, randy goulding, santa fe trail by Press Release. Bookmark the permalink.